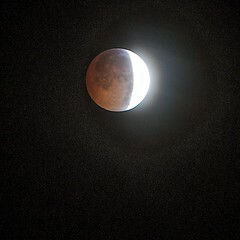 If you were pleasantly asleep last night from 1:30 to 4:30am then you missed the lunar eclipse. No worries because WeLoveDC’s Flickr photo pool, NASA and Huffington Post have you covered with a robust recaps, videos and photos of the celestial event. The total lunar eclipse coincided with the 2010 winter solstice, an combination of events that had not happened for 400 years and will not happen again until 2094. PSH 2094? I can totally live that long.